No texts but synopsis, historical notes, music analysis and artist bios in German, English and French can be found in the booklet. Johann Strauss was not particularly successful in his choices of librettos for his operettas. His first work in the genre, Indigo und die vierzig Räuber, premiered at the Theater an der Wien on 10 February 1871, was praised for its ‘irresistible waltz motifs’ and ‘sparkling dance tunes’ but the libretto was found unsuitable. Eduard Hanslick called it ‘music to pretty clothes’ since the production was lavish but the story thin. For his next operetta Strauss spent a lot of time finding something more worthy of his musical talent. Eventually he settled for a play by Victorien Sardou, Piccolino, which was adapted by Josef Braun and with lyrics by Richard Genée. During the two years that elapsed before a finished product emerged, several ‘advisors’ were involved. The premiere took place at the Theater an der Wien on 1 March 1873 and the public was very positive – it ran for 81 performances – while the critics were divided. During the next ten years it was also seen in Berlin, Naples, New York and Prague. After the composer’s death it was revived as Der blaue Held. With a new libretto and some reordering and abridgements of the music it had become a vehicle for nationalism. This was in 1912 and the Balkan crisis was imminent. In the early twenties Felix Weingartner took up the original version at the Volksoper and I believe it has not been totally absent during years to come either. At least there was a recording by the Cologne Radio under Franz Marszalek in 1950 with Peter Anders as Arthur Bryk. And the plot? We are in a village in the Swiss Alps. A young girl, Marie, has fallen in love with a painter, Arthur Bryk, who promised to marry her before he went to Rome. A year later she meets two other painters who tell her that Arthur is in Rome and she decides to go there too, selling the painting of her that Arthur made a year ago, to get the money needed. There are side plots, but let’s not bother about them, only mention that there is a Count and a Countess who have relation problems. In the second act we are in Rome, where the city is preparing for the annual Carnival. The other characters from the first act are also there. Marie, disguised as a young man, finds Arthur, but Arthur has fallen in love with the Countess. For that purpose he, now disguised as a monk, suggests to the Count that the Countess stays at a convent. Next to the convent there is a hotel where Arthur arranges an artists’ party. He sneaks out and hurries to the convent to meet the Countess, but Marie, who has been accepted as Arthur’s pupil, follows him, now in women’s clothes. She pretends to be the Countess and in the darkness embraces Arthur. The real Countess appears and is horrified to see her beloved in the arms of another woman and sounds the alarm. Curtain! In the third and last act Arthur invites the Countess to his studio to paint her. Marie, now again disguised, is present and decides to convince the painter – and the Count - that the Countess is fickle. After some further complications Arthur suddenly realises that his pupil is the girl from the Alps, whom he promised marriage. He declares his love to her. All’s well and the Carnival can begin. I have come across librettos that are much worse than this and Strauss’s music is truly inspired. Far from being a string of pearls, tied together with spoken dialogue, the backbone of this operetta is to be found in the ensembles. There are several duets, a quartet, a quintet, and two extended finales. The chorus is also given several fine opportunities. On this recording the spoken dialogue is kept to a minimum and for once the balance between the musical numbers and the dialogue is such as to allow the listener to hear every word of the dialogue without having to turn up the volume. The excellent recording was made live but there is no sign of an audience – no coughs, no sneezing and no applause. The overture is the usual medley with exquisite scoring and marvellous melodies. There’s some really fine woodwind writing in the slow middle section. And there is a waltz. But waltzes are not as much to the fore as in some other Strauss operettas and Strauss in fact called Der Carneval in Rom his polka opera. There is little Italian influence in the music, only Marie’s tarantella near the end of act II (CD 2 tr. 12) imparts some local colour. Immediately after the overture there is a long scene with almost nine minutes of continuous music. It’s also a kind of medley with a fine slow waltz followed by a polka that introduces us to Marie. The two painters have a charming short polka duet and then the Count and the Countess sing a lively and more extended duet. The high standard is retained throughout but my highlight is the duet near the end of the work, where finally Marie and Arthur find each other. It is quite lovely with the soprano soaring above the colourful orchestra. We can even hear a couple of chords that could have been borrowed from Die Meistersinger von Nürnberg. 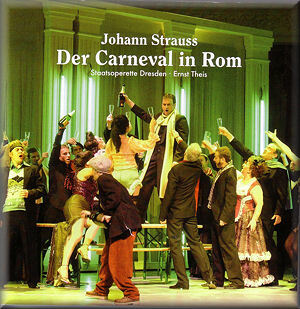 The concluding homage to the Carnival, Carneval, dich preisen wir, is a rousing gallop. The Staatsoperette Dresden has a long tradition and recently issued a recording of Strauss’s Das Spitzentuch der Königin to great acclaim. I have yet to hear it but after enjoying the present recording wholeheartedly I will certainly try to get hold of it. Chorus and orchestra are very good and conductor Ernst Theis, since 2003 principal conductor, has the right feeling. Performing before a live audience often inspires the singers more than the empty studio and this is very tangible here. The stars of the performance are the two sopranos. Isabella Ma-Zach, Marie, has glittering top notes and lively and charming manners. Her low to middle register initially sounded rather occluded but either I got used to it or she warmed up. Jessica Glatte, the Countess, has a grander voice and her coloratura singing is admirable. Her golden ringing top is especially impressive in the second act ensemble with chorus (CD 2 tr. 9). The male singers are splendid actors but that Peter Anders must have been more ingratiating as Arthur than Michael Heim is here, though he sings his third act arietta (CD 2 tr. 15) with true Viennese lilt. By and large, however, the end result is a splendid performance, greater than the sum of the individual parts. The story may be slender but the music is anything but. If you love Die Fledermaus, which was Strauss’s next operetta, premiered on 5 April 1874, you will adore Der Carneval in Rom just as much.